It was a late night working on a deadline. We had to create five SketchUp models and accompanying animated presentations. To Brian, my shortcut avoidance increased the amount of time we would spend working, meaning the longer he was stuck in the office. I come from an AutoCAD background. I was taught way back to always use shortcuts in AutoCad. I always did and still do. But for some reason, that did not immediately transfer over to SketchUp. In my first two years using SketchUp, I was constantly moving my mouse hither and yon around the screen to click on menus and icons. So I started the arduous process of re-learning how to use SketchUp with shortcuts. Modeling quickly became easier and faster, and now shortcuts are as essential as food and oxygen (OK, slight exaggeration). And if mousing everywhere was slow before, SketchUp 2015 introduced tool groups both in the menus and the toolbars. For example, Rectangle, Rotated Rectangle, Circle, Polygon are all in the Shapes pull-down. So getting to the Rectangle or Circle icon now requires even more mouse movement than in versions past. And if better tool navigation speed isn’t reason enough to try shortcuts, fewer mouse movements also mean relief for your wrist. Shortcuts are essential for those with repetitive stress sensitivity (like carpal tunnel syndrome). What Are the SketchUp Shortcut Keys? 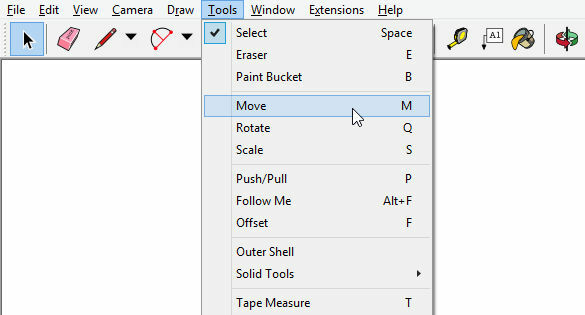 SketchUp comes with pre-loaded shortcuts for many of its tools. L for Line, R for Rectangle, P for Push/Pull, M for Move, etc. Look at the menu pull-downs to see what’s assigned. If you haven’t already, check out Bonnie’s post on SketchUp’s Quick Reference Card – another great resource for ID’ing shortcuts, as well as getting other handy tool information. And you’re not limited to the default shortcuts that SketchUp provides…. How Can I Change Shortcuts, or Create New Ones? Any SketchUp tool that can be accessed by a menu or an icon can have a shortcut. This also applies to tools you add when you install an extension. Everything related to shortcuts can be found in the System Preferences (Windows: Window / Preferences; Mac: SketchUp / Preferences). Open the Shortcuts page of this window. All tools are listed in alphabetical order by where they appear in the SketchUp menu. For example, the Scale tool is listed as Tools / Scale. 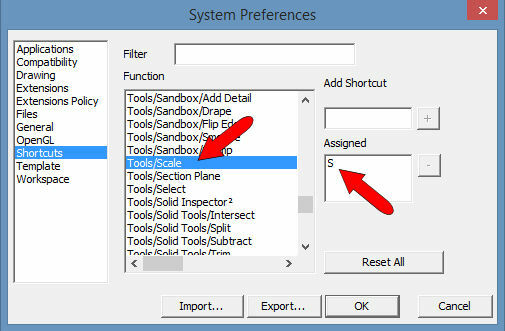 And its shortcut is listed as S.
You can also set up shortcuts to display user interface windows, like the Components or Materials windows. 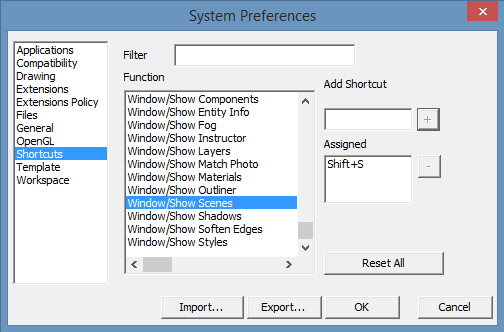 On the Mac (and PC SketchUp 2015 or earlier), these functions are listed under Window. On PCs for SketchUp 2016, they’re listed under Window / Show. Shortcuts are also very handy for switching display settings like X-Ray or Wireframe view, or for hiding edges or profile edges. This will be discussed in Part 2 of this series. Can I Receive or Send a Set of Shortcuts? You bet. In the Preferences, there’s an Export button to generate a list of your shortcuts. 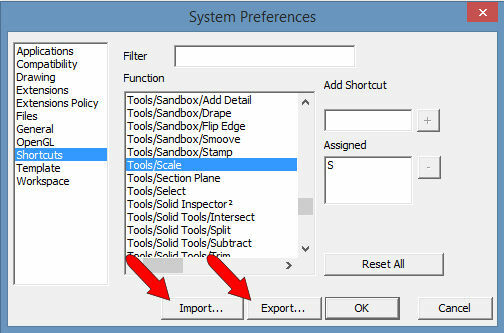 Or you can get someone else’s list, and click Import to bring their list into your copy of SketchUp. The next post will discuss using shortcuts to change your SketchUp display, stay tuned!